I started working early in my garden today. 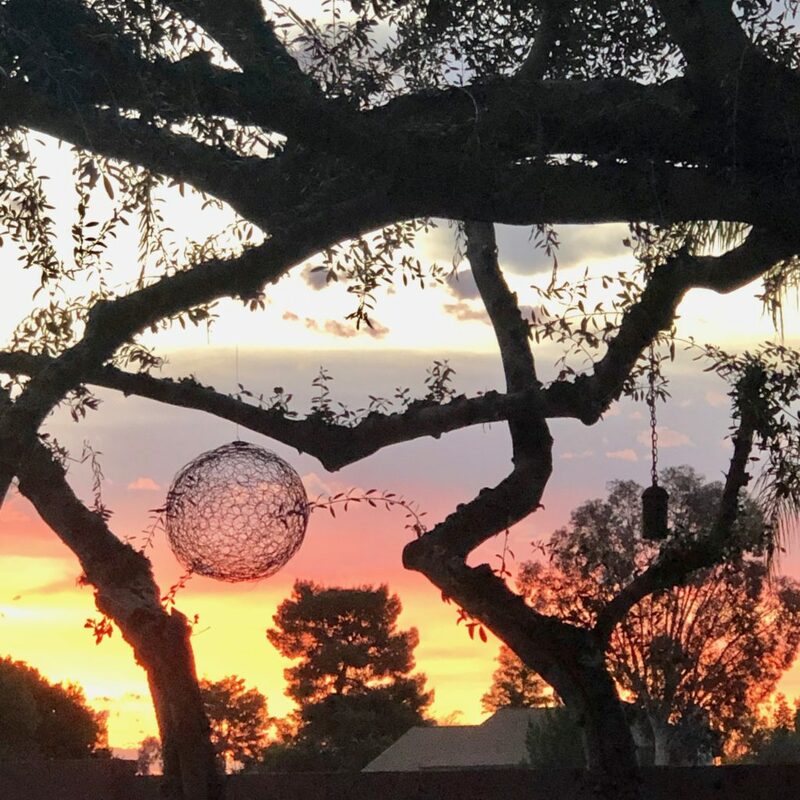 The sky was streaked with pink, orange and blue as the sun rose between the branches of my 40 yr. Old olive tree. Mocking birds were singing, there are so many different songs from this one incredible bird. 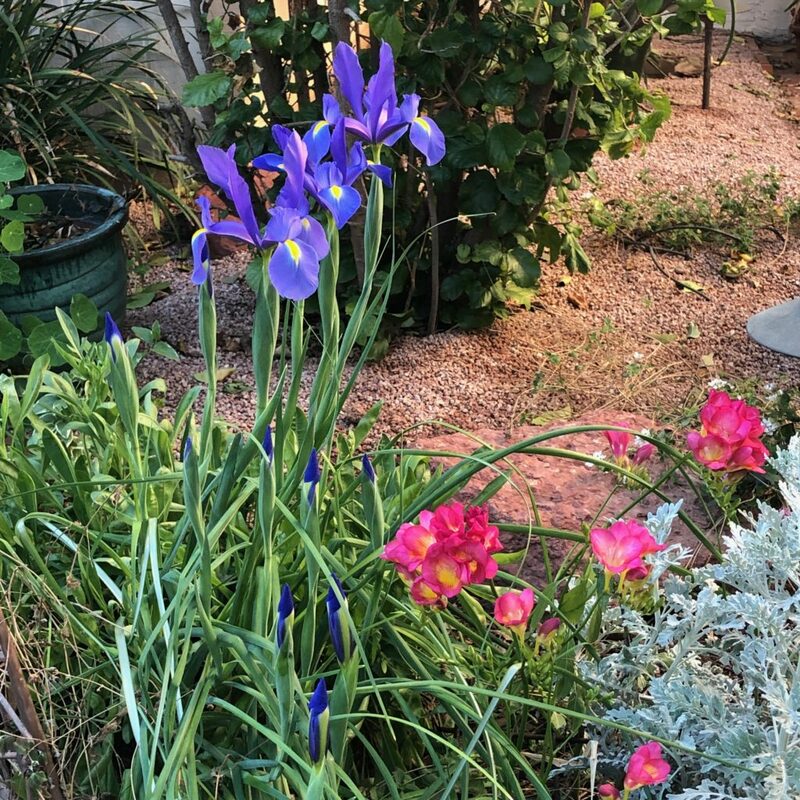 As I wander through the pathways of the garden I find the deep purple Dutch iris and pink freesias blooming, they are such a brief bit of spring color but so worth it. 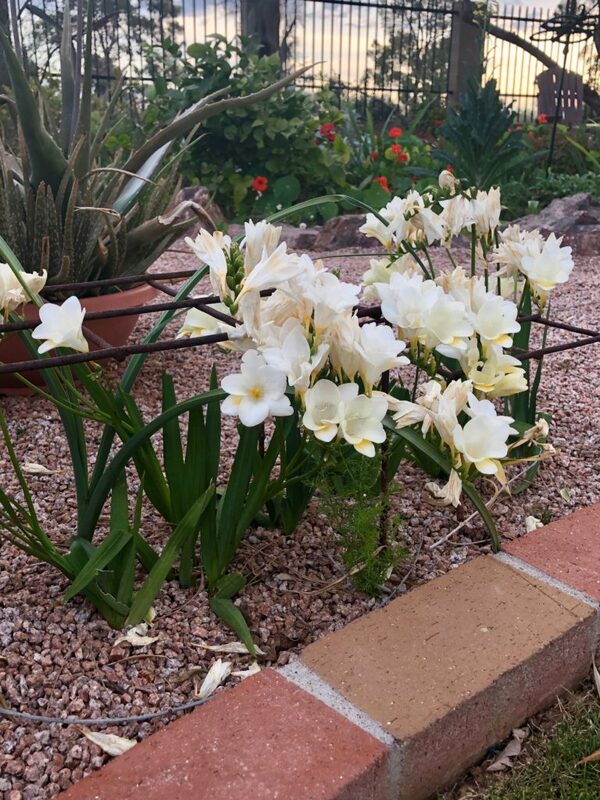 There is a stand of white freesias further out by the lawn, heavy with blossoms, they need a wire frame to support them. 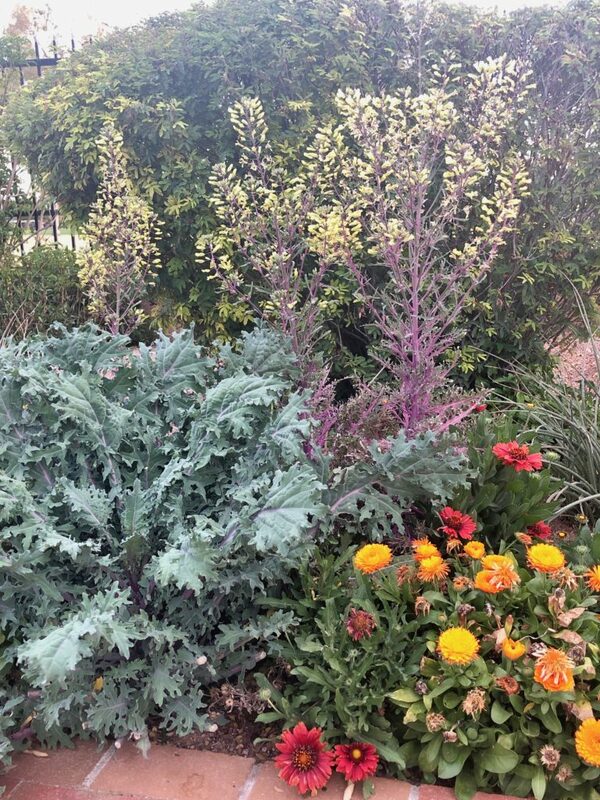 There is a bed of ruffled Russian Kale. Back in October, I was in a rush to get those plants in the ground and foolishly planted them in the front of the bed. They have grown so big they cover the orange calendula and red gaillardia. Behind the Kale is a group of decorative cabbages that have gone to bloom, so at least the yellow stocks stand above the kale. 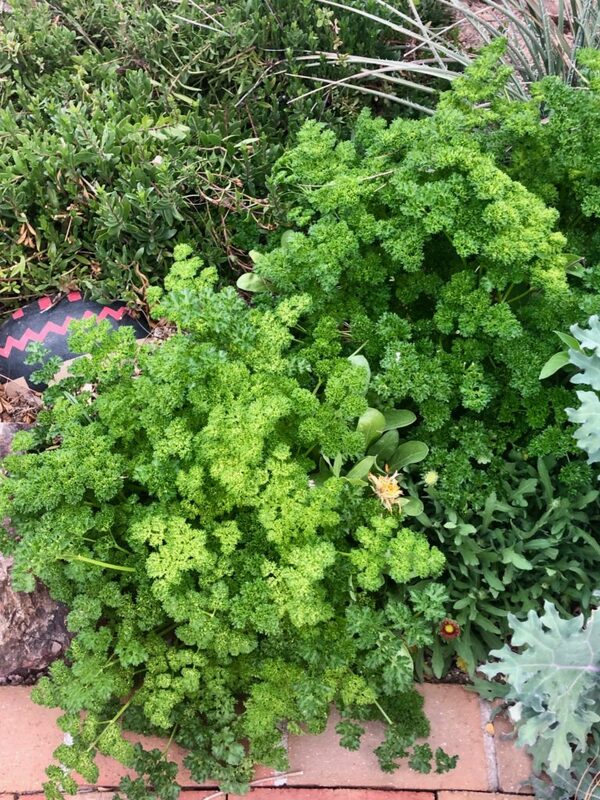 There’s parsley too, such a vivid green, I love parsley planted among the flowers, though it is only a short time away from bolting and going to seed. 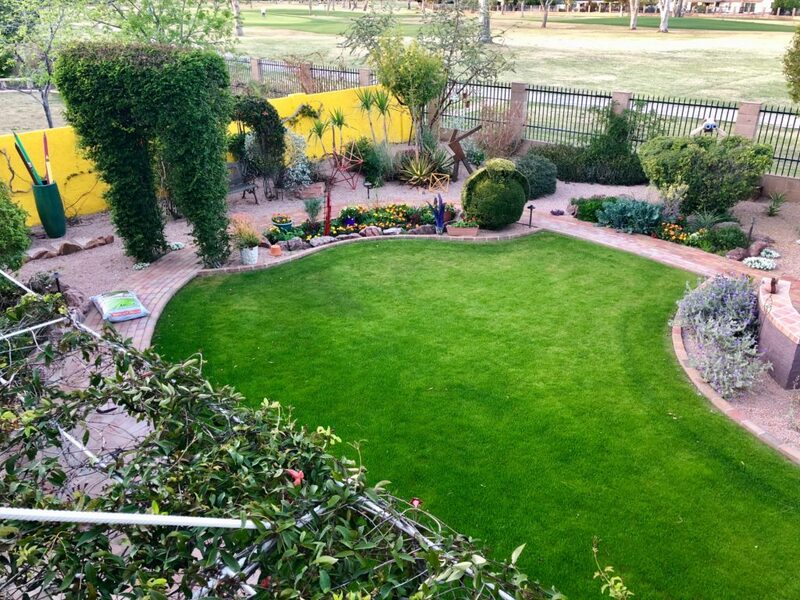 In my Arizona garden, I plant a winter rye lawn which stays vivid green with very little water all winter long. It is soon to fade away as the summer heat comes and then our Santa Anna tiff will grow through. 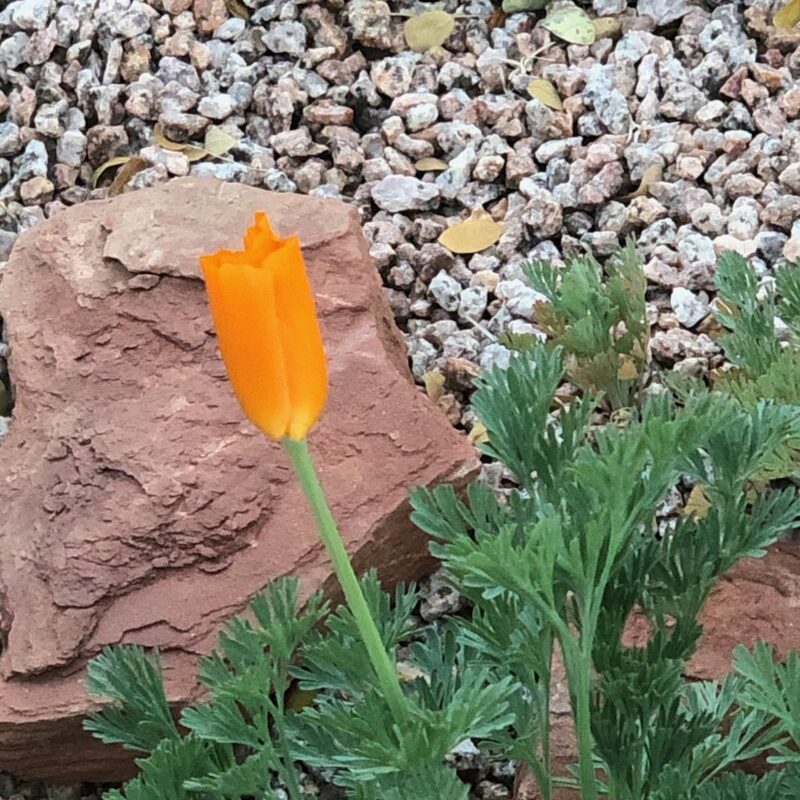 I’ve tried to grow some wildflowers, and I have a few starts of California poppies. I have one in bloom; hopefully, more will follow. 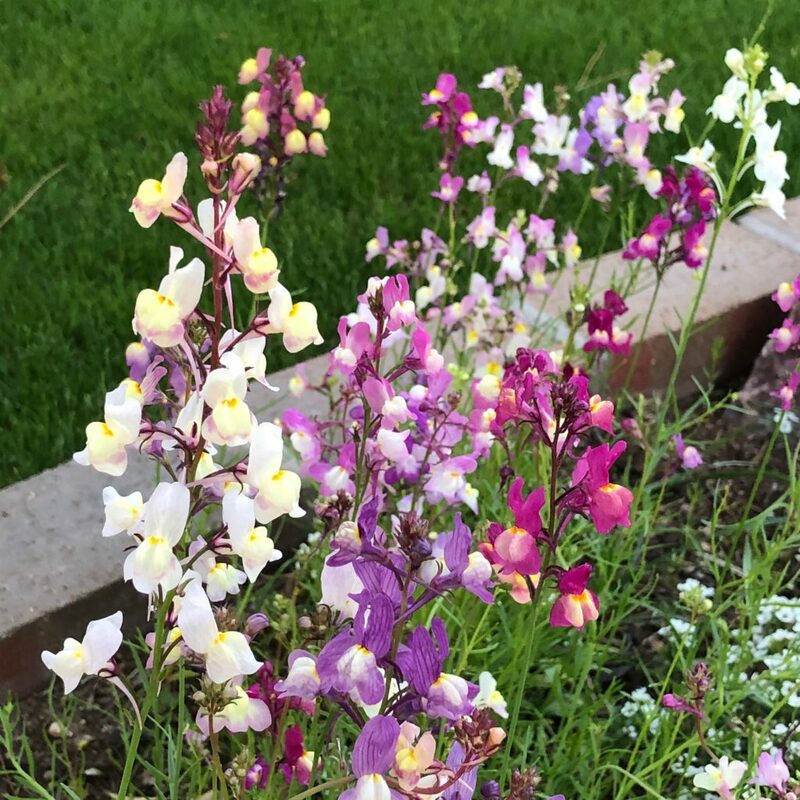 I also have some very delicate Linaria, the mixed variety, this is also called Toadflax. I hope these pretty blossoms will coax my toad out of hibernation. The research says hummingbirds prefer red flowers, but I don’t have many blooming right now, but the hummers seem happy to sip the nectar from the orange aloes and blue emu shrubs. Little brown finches chatter away in the path arbors, I think there will be a nest in there soon. On the fence, there is a pair of doves celebrating spring in their own particular way. My flowers in the ground seem to be thriving. This winter my strawberry twizzle geraniums didn’t grow very big, so the pots are disappointing me this spring, but they may get growing here soon. I have some cerinthe blooming its sweet, small purple blossom. The tangerine cross vines are beginning to bud, some of the orange flowers are open, but I’m hoping for many more soon. Two volunteer white alyssum grew right at the base of one vine, making little puddles of white scented flowers. 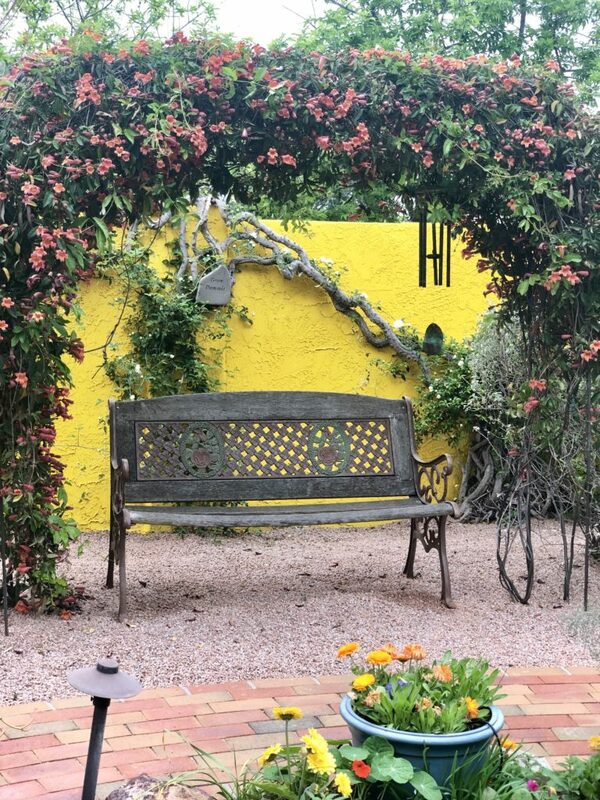 We made one spring improvement involving stucco and paint. In 2013 when we re-landscaped to install our bell, while the trenching was being done to lay new sprinkler lines we kept finding large reddish roots. They spread out nearly all across the lot. Our neighbor has two soaring pine trees right on the other side of our fence, so we all assumed the roots where from these big trees. But six months later our wall of deep green creeping fig began to collapse. Now when I say big, I mean it was nearly three feet deep and close to 12’ high. It was lush, green, it blocked out the view of the house next door. We trimmed it, we babied it trying to get it to stay alive, but eventually, we had to give up. I spent a year ignoring the sad looking wall. We kept some of the branching structure and tried planting some new vines, but nothing was making the wall look good. The fig attaches itself with little suckers, so it leaves a dot everywhere it connects. So we’ve had the wall stuccoed to give it a more uniform surface again and painted it a marigold yellow. 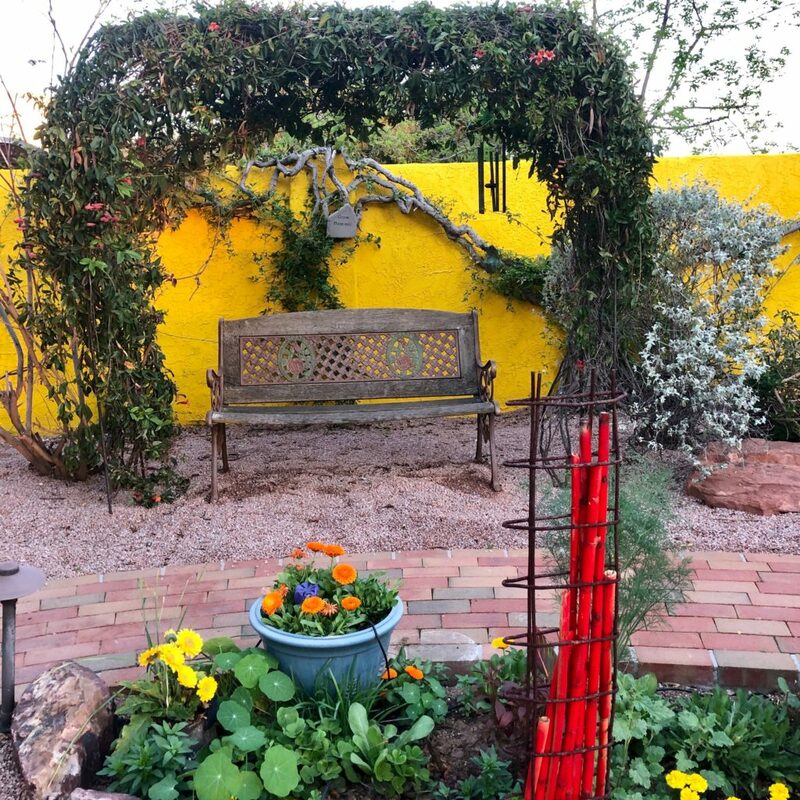 It is exciting to see it behind the green Spanish daggers, the wooly butterfly bush and the arbor over the bench. We managed to keep some of the fig wood to use as a natural arbor, for the new lady banks rose and coral vines to attach themselves to. The other wall is painted in a calming color of amazing amethyst and gives an entirely different feeling. 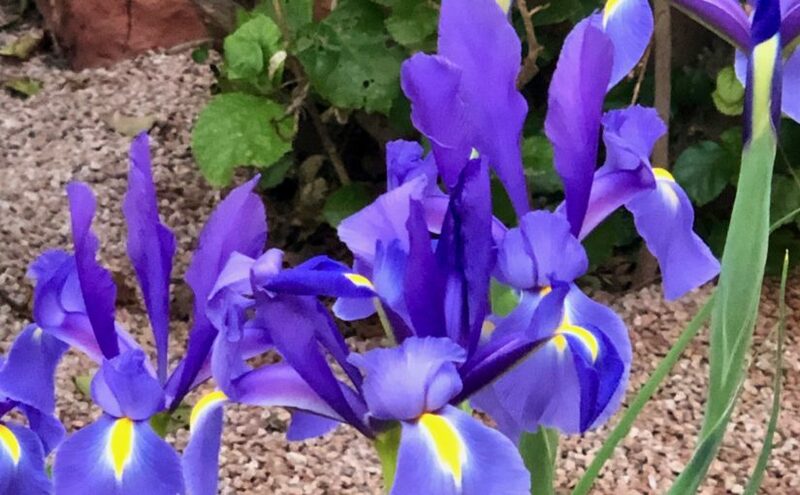 Purple and yellow move around the garden in pots and blooms. I have two variegated agaves with eight-foot bloom stalks that will soon burst into bright yellow flowers. Living on the Dobson Ranch Golf Course, we get to borrow the scenery of towering eucalyptus trees and some pines. It is an excellent place for more bird watching, with some red tail hawks and great white herons flying through. 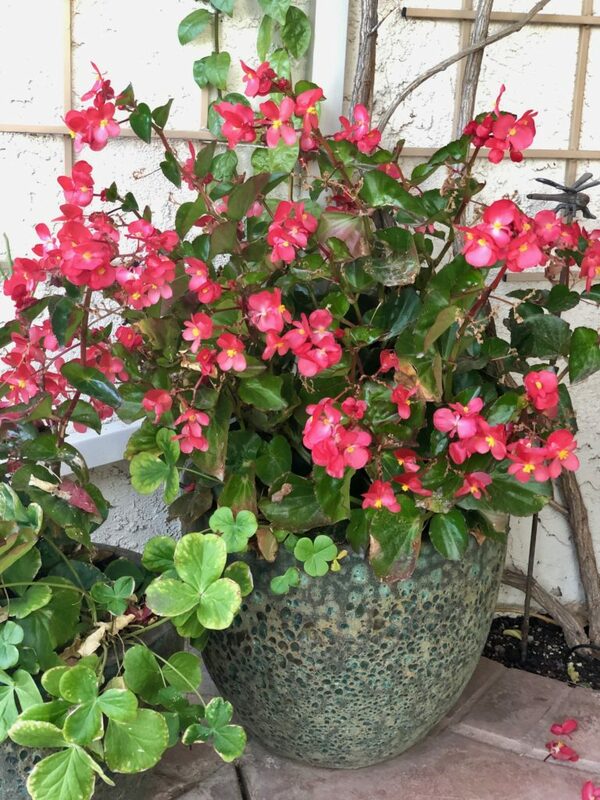 In the front of the house the patio pots are filled with red dragon wing begonias. I planted these in October and they have been covered in blooms every day since. It has been incredible to see them every morning. 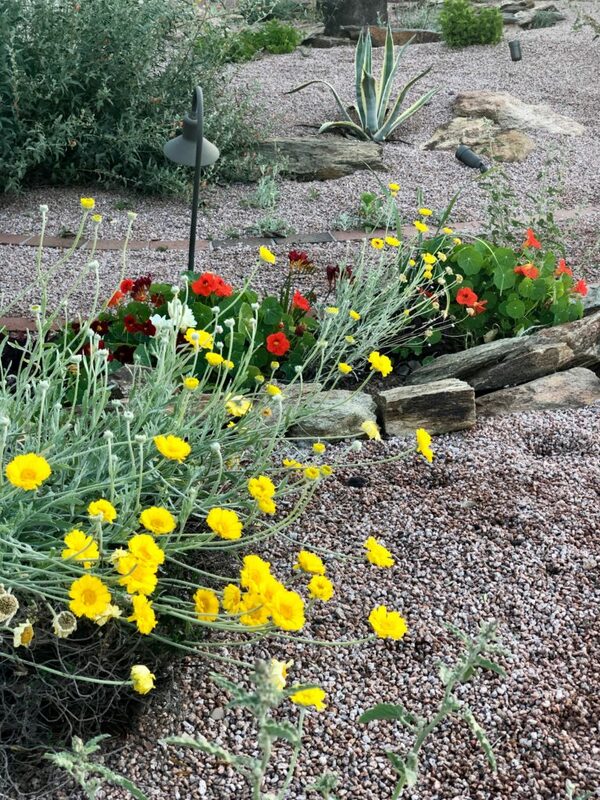 Along the front sidewalk the Desert Marigolds with their bright yellow daisy shape flowers and silver leaves form a line of color. There are orange nasturtiums, blue emus, pink penstemons and a few grape hyacinths in flower. It feels good in the garden on the first day of spring. 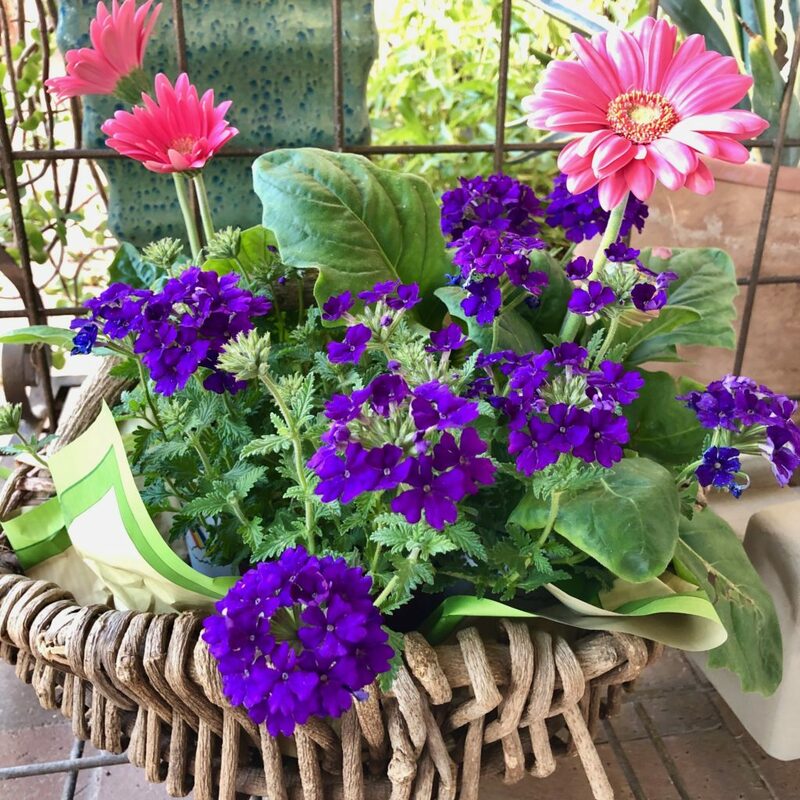 I planted some silvery dusty miller, some deep pink gerbera daisy, and purple verbena. Then I trimmed back some orange mallow and pulled some weeds. 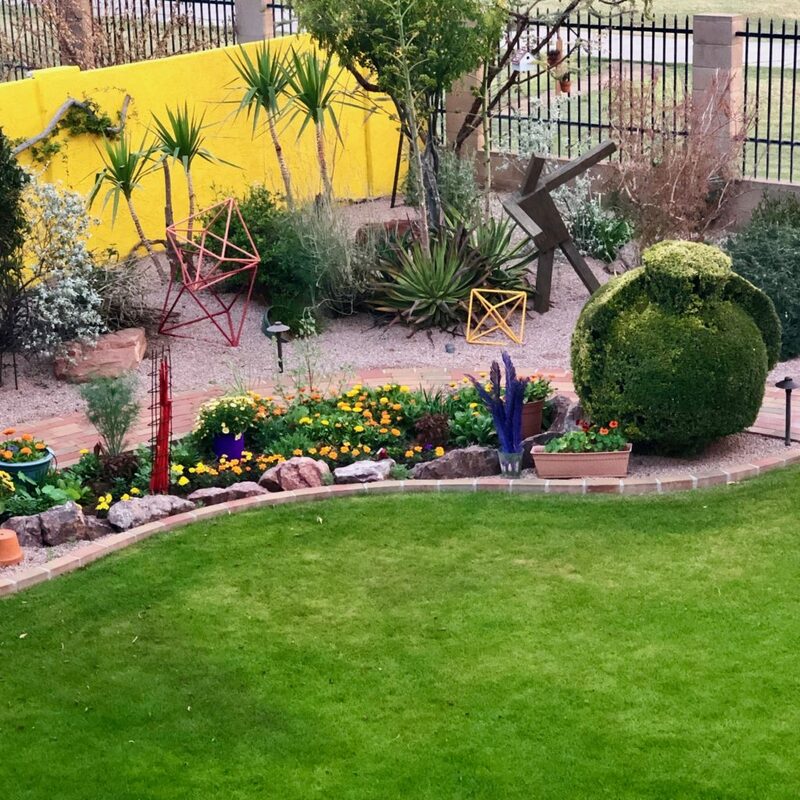 It’s ready, my garden, for some dinner parties, some visits by friends, a glass of wine with Rich at the end of the day. Which is just about now. The temperatures hit the high 80’s today and will likely cool down into the 50’s overnight. Spring is brief, yet there is so much beauty I try to savor every day. It is lovely and always so nice to look at and enjoy. Love and enjoy your talents! Happy Easter! It looks wonderful. I wish I had your green thumb. Thanks for sharing. What a lovely walk with you through your garden. I love the pots on brick, too. I will go through the walk very slowly next time. A third walk coming up, too. I love being able to enjoy it all the way here in Indiana. 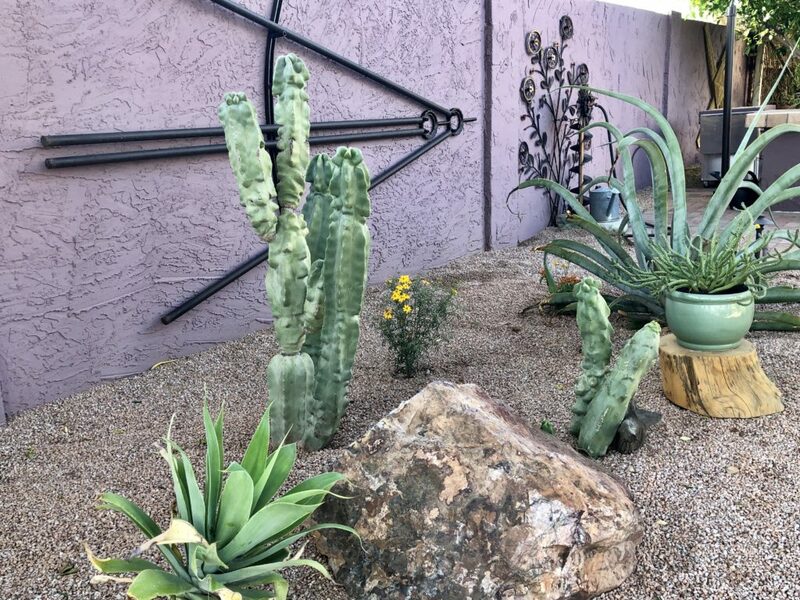 Thanks so much for sharing – I love your Garden! Thank you! I look forward to seeing you in June. It’s all so lovely. Appears to have excellent flow and the colors are awesome. I enjoyed the “virtual” tour of your garden. Thank you for sharing, Linda. 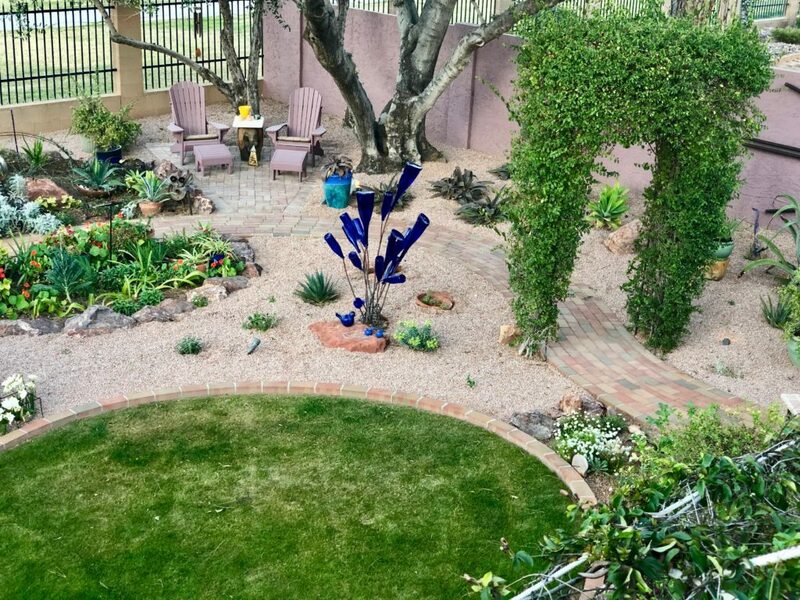 What a beautiful garden you have at home! Wow. Your garden shines. It is so fresh and colorful. Love all the different kinds of flowers.